Is Every Quality Professional a Leader? Here at ASQ we’ve introduced a powerful idea that I think can and should help shape our future. The idea is this: Every quality professional, a leader. Like a lot of fundamentally important concepts, this sounds simple and straightforward but needs to be thought out a bit. In short, we want, need, and expect every one of our members—and indeed, every person in the quality community—to grow and develop as leaders. We at ASQ understand and endorse this idea and accept the implicit responsibility to help our members do just that. You may hear much about leadership, but some—or even many—quality professionals don’t get opportunities to participate in leadership training. For a lot of ASQ members, I am convinced that whatever we provide may be the only leadership training they get. So what is this connection between leadership and quality, and why is it so important? Simply put, the quality professional, wherever he or she may be and at whatever level of management, must be a leader to be effective. The quality professional at work somewhere in the quality field is not an artist alone at the canvas. That professional is bringing insight, tools, principles, and personal example to someone—to some crew, team, or section; to a business unit; or to something even bigger, such as a hospital, a federal agency, or a school system. This task is going to be bigger than the sole person, perhaps much bigger. It will involve other people, with all of their complexities, strengths, weaknesses, hopes, and fears. So whatever our quality professional is working on, it is going to take leadership to get the job done. Some have made the case recently that quality professionals lack the business skills needed to connect with the C-suite. Others note that quality professionals sometimes lack the “soft skills” needed to make the case for quality outside the quality department. Leadership encompasses all of the above. Business savvy, people skills, and decisive action all are required to get results in the world. Now I want to hear from you. Do you think you are a quality leader? What kind of leadership training did you receive and was it enough? I took a strange path to becoming a quality leader. I learned my leadership skills first from the US Army as an ROTC cadet. The Army did not need soldiers in 1999, so I went to work in restaurants where Buffalo Wild Wings taught me lean and management skills. After 5 years of working until 3 am I decided to get an MBA and get out of restaurants. Now I lead quality improvement efforts at a small rural hospital. My predecessor did not have leadership skills and she struggled at making the connection between the improvement and the people asked to change the way they work. Understanding that asking people to change and involving them in the change process and telling them to change will have different results is key to becoming an effective leader. I see myself as a leader with a lot to learn. Over the course of my career as a Quality Manager, I have taken multiple leadership courses such as Situational Leadership, Operations Management, and will continue to take courses. Two ASQ courses that were extremely beneficial to me were CQIA and CMQ/OE. I recognize that a leader uses many management styles. A leader aligns his objectives with the companies vision, believes in the vision, and communicates the vision. A leader recognizes that through employee empowerment, employee rewards, internal and external customer focus, creating quality awareness, employee involvement etc. a culture of quality is born and can thrive. This epiphany of higher level thinking, has made me a better leader. I feel very strongly connected with the topic here and I started my career in Quality department of an automobile manufacturing company after my mechanical engineering. I was fresh out of college at that time and did not know much about the soft skills needed to be successful in professional life. I owe my career to the “Quality Mindset” which I have acquired while working . I learnt all the tools and techniques used in root cause analysis, interviewing, problem solving, managing change and presentation skills while working in the QA . I have also gained the systematic thinking mindset while working on the QMS development and from there learnt the alignment of Policy, Vision, Mission , Objectives at all level of the organisation and also the benefits of selecting the right measures. Most of the time Quality representative in a team is looked as a Police man , but with the correct understanding of the usage of the teachings from the “Quality Mindset” the same cane very easily be transformed into a Risk Prevention or a Solution Provider role, which I have been able to demonstrate. I am fairly new to the quality profession (one year of experience), but I understand how important leadership is to become a successful quality professional. This understanding makes me look for any opportunity to learn some leadership traits and principles. I go to college for “Organizational Leadership and Supervision” which I count as formal leadership training, but I also like reading books about leadership and management which I consider informal leadership training but very valuable and helpful. As law enforcement employees are not LEADERS in the LAW (the Law is the Law) and not established by those working in regulation of the Law (most work in the system of education, monitoring and enforcing the LAW). Most in Quality are the same – regulators and (as much as we still hate it the enforcers) of the policies and practices that are REQUIREMENTS to do business today with successful Customers. To say Quality professionals lead Quality, implies the BURDEN of compliance and SUCCESS to Quality Standards is the responsibility of those in the direct field of communication and enforcement and regulation to compliance. So to say a Criminal is the result of poor leadership skills of Law Enforcement professionals is no truer to me than in most cases poor or lack of quality performance in an organization is a result of poor leadership in all the quality professionals in a company. Reality to me of the main source of leadership of true Quality is that it is the responsibility of the senior management team especially the CEO/Presidents to ACCEPT then lead and establish that Quality is a contractual agreement with Customers of established standards that are not NEGOTIABLE nor OPTIONAL. This leadership starts with those in that TOP LEVEL of Management who are then charged with ensuring they have the strongest team of quality professionals to build systems and processes for the education – monitor and implementation of those standards the same as they do with their teams that are charged with excellence in their other business standards (Accounting, Engineering, Sales, Purchasing,…). Quality expectations (if accepted as a hard tangible requirement) are established by Customers and Consumers/Users of the output of providers . Quality should not be treated as a intangible secondary sub-option we strive to get better at through having a department of people who need to influence or convince to support the desires and requirements of our Customers. Placing our success at the feet of the quality persons in our Companies to sell that message to the rest is simply not successful. The message of production, delivery and cost will ALWAYS over ride Quality if it is an OPTION dependent on the strength of salesmanship of such a concept. Quality must be accepted as tangible and real as an established PRICE. Price is not optional – it is the requirement of all to MAINTAIN and ensure it is met. Quality leadership is best served when the senior leadership of any organization OWNS this message and establishes it is NOT optional or something we “try” to achieve. It is a hard tangible out put that is established and agreed to by contracts with our Customers. Failure of quality should be treated the same as failures of delivery, pricing and especially financial targets. They are met with UNACCEPTABILITY and hard actions for ensuring it will not happen again. We still treat Quality all to often as a soft concept that we STRIVE to meet through messaging and motivation. As such it does not have the same ramifications of not meeting other HARD TANGIBLE EXPECTATIONS and REQUIREMENTS. That leadership can only come from those who are EMPOWERED to enforce the standards for the all requirements. I am with all of those who have answered above and in addition I would like to point that we Quality professionals play a important role as a leaders in wherever field we work in. I have taken my first leadership training in the Lean Six Sigma Green Belt course and since then I have been gathering more and more information about it to become a better leader. Nowadays, I understand better my role in the world and can be take decisions with a more clear vision. Summing up leadership trainings will never be enough. Quality professionals are leaders. Frequently they do not chose the role as much as circumstances, fate, or being there creates leadership opportunities. V and a small few see the opportunities. Leadership takes courage, commitment, and the ability to communicate something that few initially understand. It takes effort, energy, and enthusiasm to provide a path others do not see. If we look back to Deming, Juran, Crosby, or others, we see they had a vision that we rode in on the shoulders of giants. If the language needs to be in financial terms or it needs to be statistical proof, quality professionals are the leaders who recognize the vision and move the vision forward. I 100% agree with this. Many believe leadership is only for those in management, but leadership ability is necessary for effectiveness in all areas. My company helps businesses by combining the tools of quality with leadership training to help them become more effective. My aim is to also provide leadership training to quality professionals so that they can become more successful. 21 Irrefutable laws of Leadership is a great book to start with if you want to have more impact as a quality professional. This article touches on a matter that is close to my heart at the moment based on incidents that occur in my work space; unfortunately every Quality professional is not a leader. Further to that not every quality professional has a full grasp on what Quality is about. It is imperative therefore for ASQ to continue to make material accessible and affordable to individuals in the Quality movement worldwide. In terms of my own training, I have also recognized that apart from my formal education, Quality training and Leadership training and experience, I do need to sharpen up my Business skills in order to become a more effective professional. One very big disconnect that I see is that Quality field is not where senior leaders get groomed to run companies. Sales and Marketing, or Operations is where most CEO’s background is from, and even though many have done part of their career in Quality, generally, it is their time in other departments that qualifies them to move up in the organization. I did not learn the leadership skills that I have from my time in the Quality organization, mine was from factory operations. I don’t think that experience only in the Quality areas of most companies is adequate to prepare people for being a senior leader in those companies. In short, I think Quality as a career is a bad idea, I think Quality as part of every business persons career experience is a great idea. At the very top of ASQ’s home page we have “ASQ: The Global Voice of Quality.” I think as an organization we missed the mark. It should be “ASQ: The Global Voice of Business”. Quality professionals are absolutely leaders. We help to guide people to new ways of thinking. We are the ones that find ourselves leading change efforts…or putting a halt on actions that are not value added. Others expect us to be knowledgable and decisive. Sometimes the scenarios we find ourselves involved in can be controversial and it is during those times that we must use our soft skills to communicate with others. I continue to look for leadership positions within my organization. I believe that my background in Quality has more than prepared me to take on the challenges that a leader must encounter and overcome. I do see myself as a leader. I could not have made that statement a couple of years ago. I only “thought” I was a leader. That was when I began my personal growth journey. It has transformed my idea of leadership as well as my leadership abilities. I have a long way to grow, and I will never stop growing. I can say that this has made significant improvements in the way I approach quality, and our quality initiatives. After understanding and experiencing what leadership really should be, I have embraced the importance of having my quality team become leaders. We have started a Lunch-n-Learn program where we are studying leadership each week. We started with the concept of personal growth, and we will not stop learning and growing. The connection between leadership and quality, or anything we chose to do, is extremely important. Although lacking in many organizations, it can be overcome with dedicated quality leaders willing to step out of their comfort zone, look in the mirror and say “It begins with me”. When I started my quality profession I became aware of the need for influenece without direct authority. I was not able to find a lot of information on this subject so I moved to Leadership to apply those principles towards influence. Whatever the title or authority we hold in Quality, our coworkers look to us to lead them through the maze and define it for them. Quite often they are surprised to learn that they do know a lot more about it and are supporting it more than they think. I have always considered myself a leader of the business in general. Quality is a cross-functional discipline. Therefore we need to be able to speak to every function, every department, every aspect of the business. We must consistently drive action, results, data-driven decision making, accountability and CI. Our attitude towards others should always be to teach. our main message should be “follow me” and our value is in problem solving, bridge-building and example setting. Our warrant is our patient or customer. So yes, soft skills, hard skills and business acumen are just as muc tools in our repertoire as Six Sigma, SPC and the PDCA cycle. I do feel I have received a great deal of leadership training. I could use more. It is an inexhaustible subject area and a skill you will work to master for a lifetime. I actually work on leadership with my staff as well, as part of their development plans… It is that critical. In the end, we can have a great impact as quality professionals. Influence and moral suasion are our currency. Leadership is the means to wielding effective influence. A quality professional must see him/herself as a quality advocate which absolutely requires leadership. It requires the skills to influence others to want to change. It is about changing the way people think, about changing a culture. And, most definitely it takes business savvy which is the skill to speak in business language to get results. Inevitably, a quality professional has to have the financial IQ to be able to make money for their company and thus not be seen as overhead cost. I have been in the industry 10 years and know that without leadership, we are just that – a cost. After 27 years as a quality management consultant in all types of industry and service I have to say that “leadership” is a misleading concept. Try “leading” two or three operating superintendents who have just come off shift, working in a gale to carry out repairs on a ship. My job is to guide, and combine skills of watchdog (are we meeting the requirements), with sheepdog (is everyone gathered in and going in the same direction). A shepherd does not “lead” the sheep. They must be encouraged and nurtured while being introduced to unfamiliar processes to which they are contributing their experience, then monitored, until, to the astonishment of everyone involved, we have reached our goal. I agree that every quality professional is a leader. We are the standard bearer for the organization. Each day we must set and ensure that the organization products and/or services met and exceed customer expectations. When those expectations aren’t met, the customer turns to the quality professional for an answer and assurance that the problem will not happen again. The profession can be a challenge. No one can do it alone, you have to be able to effective influence and convince others that their role is an important one in producing a quality product. Leadership doesn’t necessarily equate to being in management, we can lead by being the voice of Quality, partnering with the Management, sowing the seeds of Prevention, DMAIC, and lessons learned thru RCCA tools and philosophies. Just like being a manager does not necessarily equate to being a leader. Opportunities abound in every organization, to practice our Q skill sets; every risk/issue is an opportunity to hone our leadership voice. I have a long career in quality, sometimes longer than I care to admit (I remember doing SPC on paper using a calculator!) but the culture and type of organization can either encourage and grow someone into a leader or stunt their growth and leave a bad taste for the term. We know what a leader should be, and what qualities they should possess. Some of the old school quality gurus were great leaders. Unfortunately, a lot of companies are still looking for managers, fall guys, or whipping posts for their quality function. Burn out and turn-around rates for these positions are off-the-charts. So it behooves the quality professional to school themselves completely on the company they are considering working for. I learned some leadership skills from great mentors and training, but what I really learned about leadership I got from the school of very hard knocks. I Totally agree with Deborah Ybarra, definately been there in your shoes and it stinks. This 100% unacceptable business practice and plays a very Big part in business failures, downfalls, and back-sets due to the upper managements insecurity and ignorance and damaging a person’s knowledge, integrity and wrecking everything around in the professional’s area of expertise. We have to hold our heads high and press on. Somewhere down the road you will shine. Just don’t give up! Escape Goat, Fall Guy, Whipping Post is beneath me and I will not accept such unethical behavior. Thank you for your feedback, everyone! It’s much appreciated. Like it or not every quality professional is a leader. Remember that we represent the voice of the customer an awesome responsibility that requires you to lead. It is not always going to be easy going against the mainstream but we have to speak up, because if we don’t then who will. Take the challenge, embrace leadership and as the Quality of our products improve we can sit back and watch America once again become the most prosperous nation on earth. Quality professionals are experts in quality and are not the organization’s leaders. The latter are in top/senior executive positions, whereas quality professionals are dispersed throughout the organization. We need to remember that even though quality may be the central, overriding, focus of the organization, not everyone in the organization can be a quality expert, just as not everyone can lead the organization. Paraphrasing Tina Turner, we don’t need another leader and leadership but, rather–and here I’m paraphrasing Victor A. Thompson (Modern Organization, pp. viii-xi)–more quality professionals and MANAGEMENT analysis, thinking, and programing. Then we’ll find the way home; the optimum path for ongoing improvement of organizational processes and structures. In IATA we are going through a program called “Empowering IATA Leaders”. The programs looks at 3 major aspects of Leadership: building high performing teams – leading & implementig change – emotional intelligence. I have recently been promoted as the Director Quality & Risk Management in the Safety & Flight Operations division of the organization and this program provides me with lots of information and tools that I find very useful (even after almost 40 years of professional activity in managerial positions -:). I can confirm that leadership is a necessary skill if you want to “promote” Quality. In our aviation industry we do not only need the very technical tools and methods that Quality can provide but also we use the principles of Quality to support the improvement of the safety in the ongoing operational activities of an airline. This requires the capability to see the big picture, to convince your entourage to follow you on your path to Quality. This entourage is both horizontal and vertical, it is your executive management, your peers and your colleagues/subordinates. Thank you, one and all for your comments. I love this discussion and I have learned a lot just reading through the replies. I hope we can continue the discussion and expand it to include even more of our members. I remain convinced that we will do immeasurable good if we can combine solid leadership skills with quality expertise. A great book on leading from where you are in the organization is John Maxwell’s “360 Degree Leadership”. It’s worth a read, and I read it after receiving many classes on leadership skills while at IBM and Corning Incorporated. Quality professionals can be leaders – if they want it enough to learn and practice leadership theory and principle. 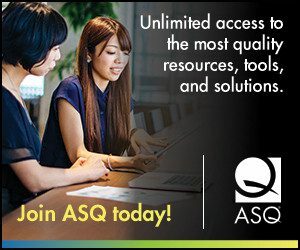 If you are interested in learning how to gain leadership skills aimed straight improving your quality practice you should join the ASQ Human Development and Leadership Division! Check out our website at ASQHDandLorg for a list of our past and current webinars and primers. All free to our division members! I feel that the theme “Every quality professional, a leader” is for self introspection for each individuals in professional life and personal life. Every day we overcome challenges and problems in our personal and professional life. If we just look back on the way we solved or overcame the challenge, knowingly or unknowingly we use Quality Tools and Problem Solving Techniques. In personal life, when we teach a small kid and in build confidence, we use Management techniques. I feel being in the Quality Profession is a challenge, because at the end of the day, the organization reputation is remembered on Quality and not on price which was paid. During my first 15 years I focused on traditional tools and methods to improve processes and products. Today, as a Quality leader, I strive to be a mentor and coach, helping others to grow and succeed. Today’s increasing rate of change and complexity requires transformational leadership; to be a performer who achieves results and also a community builder who helps others in the organization to succeed. Transformational leaders establish enhanced, more effective mindsets within their community. They are inspired by a deep understanding of individual and collective purpose; and they successfully bring into creation that which previously did not exist. Current ASQ Chair Stephen Hacker has authored nine books on the topic of transformational change including most recently, How to Coach Individuals, Teams and Organizations to Master Transformational Change: Surfing Tsunamis. Previous Previous post: How Does Quality Fit Into Social Responsibility?